Zera Shimshon, homily on the Torah and the Five Megillot, by R. Shimshon Chaim son of R. Nachman Michael Nachmani. Mantua, . Segulah for offspring, good life and plentiful livelihood. 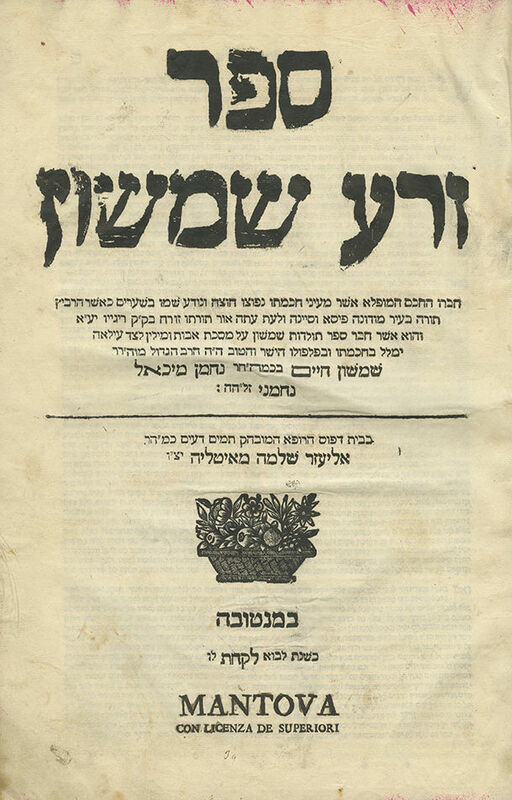 The author, R. Shimshon Chaim Nachmani (1706-1779), was an Italian kabbalist and Torah scholar. He disseminated Torah in Modena and Mantua and edified disciples who later held rabbinic positions in several Italian communities. He also authored Toldot Shimshon on Tractate Avot. The Chida wrote that he was proficient in practical Kabbalah and had ordered his kabbalistic writings to be buried in his grave (Shem HaGedolim, Maarechet Sefarim, 46). In the preface, the author implores "with ten expressions of prayer" to study his book, and blesses the one who does so: "The One who repays will recompense you… with the threefold blessing of offspring, life and plentiful livelihood". Further in the preface, the author writes that since his only son had passed away, leaving him without any descendants, he named his book Zera Shimshon, and promises: "And your eyes will witness sons and grandsons like olive shoots around your table, wise and intelligent, and houses full of goodness, neither wealth nor honor will cease from your descendants…". In recent years, there has been a reawakening of interest surrounding this book, and many accounts have been publicized of couples who were blessed with children in the merit of this book. These stories were recorded in the Niflaot Shimshon leaflets and later published in Kovetz Sipurei Yeshuot printed at the end of the new edition of the book (Association for Spreading the Teachings of the Zera Shimshon, Arad 2015). 104, 108-115, , 117-62 [i.e. 162]; 21,  leaves. 33.5 cm. Thin, light-colored paper. Colored edges. Good condition. Stains. Leaves trimmed close to text of printed marginal notes in several places. New binding.